In case you don't know who the Boy Scouts of America (BSA) are, they're the ones who sell the popcorn, not the cookies. They're also the 85-year-old organization that has helped generations of young American boys learn how to tie knots and create fires from sticks — or something. But, in all seriousness, BSA's mission, according to its website, is "to make ethical and moral choices over their lifetimes by instilling in them the values of the Scout Oath and Law." And now, that statement means the program will benefit with the Boy Scouts' new gay leader policy since the organization is lifting its ban on LGBTQ adult leaders. Just two years ago, BSA allowed gay youth members to join the organization after 1,400 members voted 61-38 to change the leadership program's national rules. Since then, young gay members could camp, fish, tie square knots, and become upstanding citizens no matter their sexual orientation. But in that same sweeping vote, BSA reaffirmed its policy to keep gay men from being Scout leaders. Now, BSA is extending that same acceptance toward troop members to the very leaders who teach them how to do those outdoorsy things. 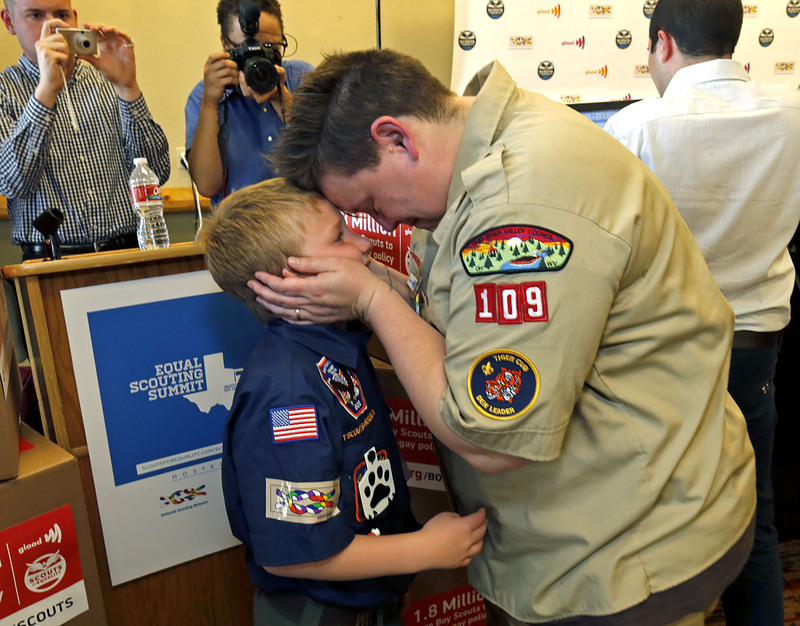 Scouts for Equality Executive Director Zach Wahls said in a statement the changes reflect the Boy Scouts' true values. For decades, the Boy Scouts of America’s ban on gay adults has stood as a towering example of explicit, institutional homophobia in one of America’s most important and recognizable civic organizations. While this policy change is not perfect — BSA’s religious chartering partners will be allowed to continue to discriminate against gay adults — it is difficult to overstate the importance of today’s announcement. And Wahls makes a good point. Now that the organization has decided to make a change for the better, they can only benefit from their progress. Here are three ways BSA will see immediate, positive results from its new resolution. As Dominick Scudera pointed out in the Huffington Post, bigotry affects children more than it does the adults at whom it's aimed. When BSA prevented LGBTQ adult leaders from entering leadership roles, it also kept out important mentors from boys who needed them. According to Pacer, about one in every four students reports being bullied during the school year. With the BSA's ban on gay leaders lifted, hopefully some of these students will have a friendly face to come to when life — and bullies — are cruel. The lift on the gay leadership ban won't be a perfect fix. According to The New York Times, some scouting groups will be allowed to limit their leadership roles to heterosexual leaders. Over the course of several decades, the organization has tried to appeal to a conservative crowd of supporters, but this was actually costing BSA fiscal support from those who opposed the ban, the Times reported. As Bob Dylan once said, "The times they are a-changin'." Or, actually, they've been changing for a while now, so it's about time that you picked up the pace, BSA. As Wahls noted in his statement, BSA has long been an example of "explicit, institutional homophobia," and the organization is changing that. Let's take a look again at the BSA's mission statement. The words "instilling in them the values of the Scout Oath and Law" are there in plain print. As of now, the BSA's official resolution says that yes, a gay adult can be the leader of a boy scout troop as long as that individual upholds the Boy Scout mission and values. Thanks, BSA. Now we're talking equality.